Monday, July 26, 2010-Wynne Baptist Church – When Will We Cry? 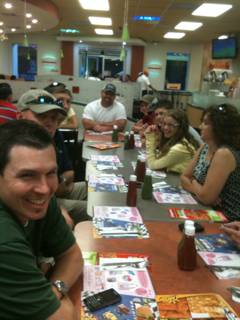 We arrived in Coatepque , at Pollo Campero’s- Fast Food Chicken joint, around 5:30pm. After dinner we drove to Piedra Partida, unloaded and prepared the dorm for our stay. Our trip out to the coast had been pretty much uneventful. We dodged a few pot holes, motorcycles and stalled cars, and only had one flat tire. All in all it was a good trip. It’s a beautiful morn in Piedra Partida. The temp dropped to 72 last night making for a good nights rest. Today is market day at Catarina so we canceled our door to door campaign. Now for Plan B – We will go to the market where all of the people will be and hand out gospel tracts. Margie and Donnie shared with man at the market. 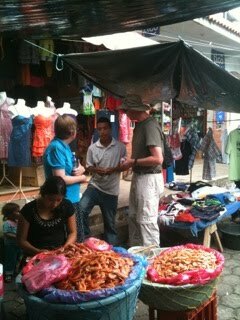 The team handed out many tracts and had a few opportunities to share the gospel. The team was blessed by how well they were received by the people and their humility. After lunch, we prepared for VBS and arrived at the church by 2:45. The children were there waiting and many remembered those who had come a year and a half ago. They greeted them as long lost friends. Around 40 children came along with several adults. 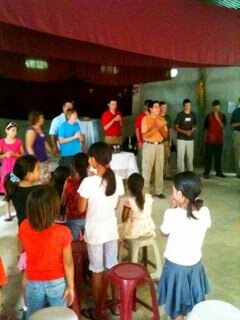 The team shared many Bible stories and songs with the children. Soon the rain came around 5:30 so we headed back to the dorm. Tomorrow, Tuesday, we will visit houses in the village and hold VBS again in the afternoon.